Such Innocent Punjab Government’s Education department officials are!! Children are future of Nation!! Children are God’s second version on Earth!! and what not we keep hearing for our dearest munchkins. They are spending their some hours at Anganwaris or Schools in hope of getting “Nutritious” Food. Poor Fellows!! They ain’t even know that the officials really do not value for their lives. Because Mid day meal is Fresh and Nutritious for Kids as it is duly “Tasted by Teachers” there as told by Education Special Secretary Krishan Kumar and DPI Inderjit Singh. Really? Are you Serious? Do u here mean that if food is tasted by teachers it shall stand as tested? There are around 1,45,2710 kids including Upper Primary and Primary wing who have availed MDM till 31 March 2018. There are around 19,790 Schools in total 22 Districts out of which 558967 kids have been able to take the meal. It is good that 71.5 percent kids are able to have food. But of What Quality as Punjab Government does not have ‘Nutritionist” on board to check the served food’s nutritious value. 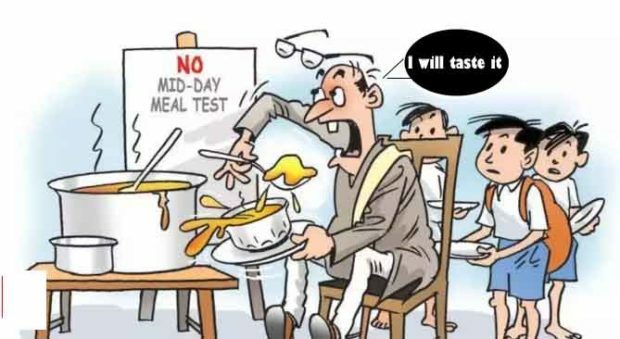 As for Government “Tasted is Tested”!! Though just a day before Punjab Food Commissioner D P Reddy told health department to take random samples of Mid Day Meal to ensure food quality of the same. While talking on this issue with Education Minister Punjab O P Soni, he says that he would certainly pass orders to department to conduct food sampling more frequently.